Bobcat hunting and trapping is cruel. The Colorado Parks and Wildlife Commission is currently considering a citizen petition to end this barbaric practice. 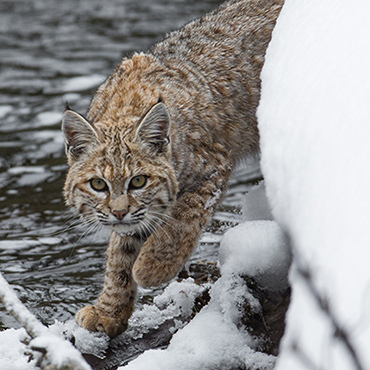 Let the members of the commission know that you want to see bobcats running free, not caught in traps or hounded by dogs and shot out of trees as trophies or for their fur. Please note: this action is only available to residents of the state of Colorado. I support the citizen petition to end commercial and recreational bobcat hunting and trapping in Colorado, for the following reasons: - It is the ethical thing to do. Bobcat trapping and hounding with dogs is cruel and unnecessary and the animals often die prolonged, painful deaths. - It makes economic sense. Colorado generates far more revenue via wildlife watching than via hunting or trapping. Therefore, bobcats and other wildlife are worth more alive than dead. - It would protect Colorado's natural heritage. Bobcat hunting and trapping is not only a threat to bobcats; it also threatens the federally listed Canada lynx, which was reintroduced to Colorado in 1999. There are only an estimated 150-250 Canada lynx in the state, and eliminating bobcat hunting and trapping would ensure that this small population doesn't suffer unnecessary mortality. Thank you for your consideration of these comments.